The Thai New Year festival of Songkran is without a doubt Thailand’s most famous, and the one for which the country is well known around the world – most notably of all for the raucous nationwide waterfights that are the hallmark of modern-day celebrations. Quite unlike anything seen in festivals elsewhere around the world – or indeed in Thailand itself at any other time of year – the Songkran celebrations that take over Bangkok and other parts of the country every April really do have to be seen to be believed. They are to Thailand what the likes of La Tomatina and Oktoberfest are to Spain and Germany. Here’s your essential guide to everything you need to know about celebrating Songkran in Bangkok and elsewhere in Thailand – including all the other elements of the festivities beyond the water fights themselves. Make the most of your visit to Bangkok for the Songkran celebrations – get to the heart of Thailand’s culture, food and sightseeing with one of our expert-led tours or experiences! When is Songkran in 2018? The three official days of the Songkran festival run from 13 to 15 April, which in 2018 fall from Friday to Sunday. Since part of this year’s celebrations occur at the weekend, there will also be public holidays in observance of Songkran on Thursday 12 and Monday 16 April, intended to make up for lost time off work. This means that in reality the festivities for Songkran in Bangkok will run from Thursday 12 until Monday 16 April. In addition, it’s common for certain parts of Thailand – Pattaya among them – to stagger the days on which Songkran is celebrated and give themselves an even longer run of the wet and wild frolics. Each of the three main days of Songkran has particular significance in the traditional Thai new year celebrations, though across the country – and certainly in Bangkok – you’ll see water-based frolics and celebrations throughout this period. What is guaranteed is that you should expect to get wet if you venture outside at all during this time – nowhere is safe from water guns, buckets of water, and friendly revellers armed with clay powder who are keen to dab some on your cheeks. All of this is harmless, hospitable and well-intentioned fun, so take it in your stride and join in with the party! Though Thailand now adheres for all practical purposes to the western calendar running from January to December, Songkran is still celebrated as the traditional new year period in mid-April. While practices vary slightly across Thailand, traditionally Thais spend the first day of Songkran cleaning their homes in preparation for the arrival of the new year. On the second day – a kind of no-man’s-land between the old and new years, when it is thought to be a bad omen to argue – Buddhists prepare food to offer to monks the following day. Making offerings to monks is something that Thai Buddhists do throughout the year, since it is believed to be a merit-making act that will bring them good fortune in this and future lives. The third day of Songkran is celebrated by Thai Buddhists by again visiting the local temple, offering food to monks, and pouring rose-scented water over Buddha images. In reality, Buddhists may visit the temple and make offerings on any one or more of the three main days of Songkran. You may also see them building sandcastles inside the temple grounds as a fun, family-friendly way to make a spiritual offering. After visiting the temple, people may pour water over the hands of the elders in their family to pay respect to them and welcome in the new year – this is the traditional origin of the far wilder waterfights for which Songkran is now widely recognised in its modern incarnation. Last year, Songkran festivities in Bangkok and elsewhere around Thailand were slightly more toned down than usual (although there were still large-scale celebrations across the capital, including sizeable crowds taking part in water fights in perennially popular areas such as Khaosan Road and Silom), owing to the year-long period of official mourning observed across Thailand following the death of King Bhumibol in October 2016. In 2018, things are expected to get back to normal, with huge, raucous celebrations of the kind witnessed in April 2016 and in the years before that – meaning it’s a great time to get out and make the most of the occasion, whether you choose to get stuck into the water fights or observe and participate in the more traditional festivities at Buddhist temples and other spots across Bangkok and around Thailand. 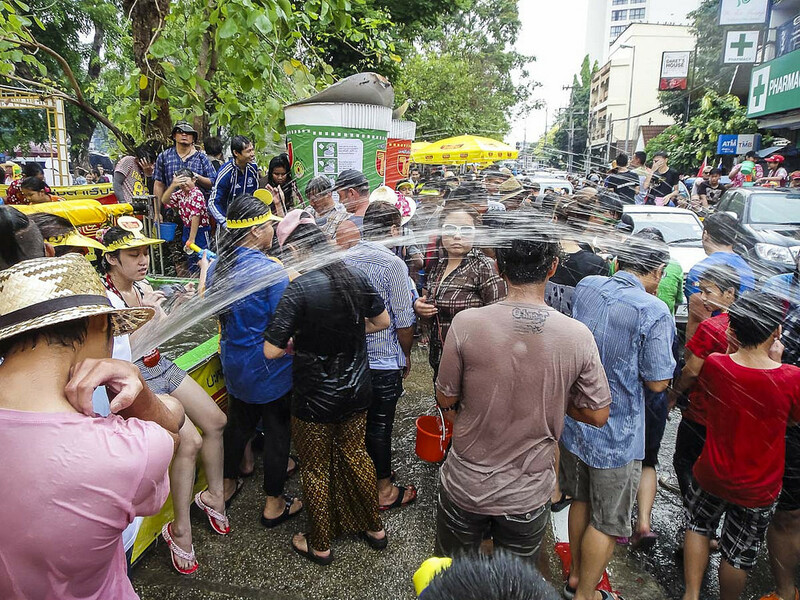 As always, there are plenty of places to celebrate Songkran in Bangkok – in fact, even without looking for one, you’ll likely stumble into the middle of a water fight as soon as you step onto the street. Particularly popular spots include backpacker favourite Khao San Road, in Bangkok’s old town area of Banglamphu, which is full of both locals and tourists indulging in a frantic water fight throughout the day and into the evening. Expect live music performances and more throughout the day, plus countless stalls set up in and around the area selling food, drinks, and all the supplies you could possibly need to make sure you can fully partake in the watery shenangians. Beware that entry to the area is usually via cordons controlled by police on the lookout for weapons; if previous years are anything to go by, police may also enforce restrictions on taking in oversized water pistols, clay powder (commonly moistened and light-heartedly used to smear on people’s faces during the water fights), and your own alcohol. If you’re not staying in the area, get to the Songkran celebrations on Khaosan Road either by taking a taxi or by catching the Chao Phraya Express river boat from Sathorn pier (connected to the Skytrain’s Silom line at Saphan Taksin station), and alighting at Phra Athit pier. Taking the boat will allow you to avoid road traffic, which can quickly come to a standstill when passing through areas where revellers have taken over parts of the roads as well as the pavements for their waterfights – however, do note that Chaophraya Express river boat services end around nightfall during the Songkran period, just as they do the rest of the year (note that the separate Saen Saeb canal boat service will be suspended from Friday 13 to Sunday 15 April). Silom Road is perhaps even busier, being closed to traffic from midday onwards and turning into an enormous battle of water pistols from around 3pm until late into the evening. As well as the main thoroughfare of Silom Road itself, which turns into a riotous circuit of people armed with water guns, buckets of water and clay powder, the small alleys just off of it – including the likes of Silom Soi 4, home to some of Bangkok’s most famous gay bars – are also packed to bursting point with revellers drinking, dancing and squirting each other with their water pistols, buckets and hoses, alongside popup bars established for the occasion outside regular bars, restaurants and the like (most of which will sensibly shut up shop in order to save their interiors from ruin). Like those celebrating on Khaosan Road, you won’t go hungry or thirsty, or be short of water pistols, water refills, goggles, or other essential Songkran accessories – entrepreneurial local traders make a small fortune by setting up countless stalls to cater to the occasion. Also like in the Khaosan Road area, in recent years police have begun to control entry and exit points to the celebrations on Silom Road, including checking for weapons and announcing various restrictions on both alcohol brought in from outside and even that sold inside the designated pedestrianised zone. In reality, these alcohol restrictions are haphazardly enforced, and we have yet to encounter a year where it hasn’t been easy to buy bottled beers and glasses or Thai-style buckets of spirits and cocktails once on Silom Road proper and the smaller side streets running off it. If you’re not staying in the area, get to the Songkran celebrations on Silom Road by Skytrain, alighting at Sala Daeng station, or by MRT subway to Si Lom station (those over 60 years old ride the MRT for free from Friday 13 until Sunday 15 April – though beware that in the past the MRT has been known to ultimately only honour such promotions for Thai nationals). By visiting a temple during Songkran, you will have the opportunity to witness the more traditional Thai new year activities away from the craziness of the modern-day water fights. Many will choose to visit famous temples around Bangkok, and a number will put on special events to mark the Songkran festival, but it’s just as worthwhile to visit whichever local temple is closest to your home or hotel, and take a look at how local Thai Buddhists are marking the occasion there. Just like in previous years, as part of Water Festival 2018 there will be traditionally themed Songkran events – centred around the idea of ‘the Thai way of life’ – at eight piers along the Chaophraya river, including Wat Pho, Wat Arun, Wat Kalaya and Wat Prayun temples, plus the Tha Maharaj pier, Yodipiman River walk at Pak Khlong Talat flower market, Asiatique the Riverfront, and newly opened heritage-themed venue Lhong 1919. Bangkok’s official Songkran celebration, featuring traditional performances, usually takes place at the ceremonial recreation ground of Sanam Luang, close to Khaosan Road – however, this year this has been moved to Lumpini Park, itself a stone’s throw from the large-scale festivities on Silom Road. The Bangkok Metropolitan Administration’s Songkran festivities in Lumpini Park will take place from Thursday 12 to Sunday 15 April, beginning with the parade of a respected Buddha image through the city to Lumpini Park on Thursday 12 April. On Friday 13 April there will be a merit-making ceremony in which Buddhist monks will receive alms, as well as a traditional water-pouring ceremony to pay respect to the elderly, while the following days will see beauty contests, traditional shows and booths, and market stalls selling speciality products from different areas of Bangkok. In addition, there are commonly concerts, food stalls and other activities to accompany water fights in the Siam Square area, and particularly family-friendly Songkran celebrations at the front of Central World shopping centre. Also returning are the usual big-name S20 Festival (at Live Park Rama 9) and the gCircuit SK12 Songkran 2018 gay dance festival party (at Central World’s GMM Live House and Zen Event Hall, and the Royal Orchid Sheraton hotel). The MRT subway is free for senior citizens from Friday 13 until Sunday 15 April – though beware that in the past the MRT has been known to ultimately only honour such promotions for Thai nationals. The Saen Saeb canal boat service is suspended from Friday 13 to Sunday 15 April (this doesn’t affect the Chaophraya Express river boat service more commonly used by tourists). The Bangkok-Pattaya and Bang Pa In-Bang Phli motorways are toll-free from Wednesday 11 to Wednesday 18 April. There’s free long-stay parking at Suvarnabhumi Airport between Thursday 05 and Monday 09 April and betweem Wednesday 11 and Tuesday 17 April. As ever, you should expect widespread closures of shops, banks, government offices, and other attractions – both in Bangkok and elsewhere around Thailand – during the Songkran festival period. Bangkok-based prolific travel blogger Richard Barrow has helpful ongoing updates on Songkran celebrations and practicalities on his web site and on Twitter. Where will you be celebrating Songkran in Bangkok or elsewhere in Thailand? Let us know in the comments! Photos by Wyndham Hollis, John Shedrick, fabulousfabs and Kim.